We had four days of fun and four sunsets on Lake Erie! Our extended Fourth of July weekend, July 1-4, 2017, was filled with many activities, each day ending with a beautiful Lake Erie sunset! Please enjoy the photos in our @sos_jr tweets and retweets, and retweet the ones that you find interesting. NOTE: please click on the photos in the tweets to enlarge them. On Saturday, July 1, 2017, we greatly enjoyed our tour of the James A. Garfield National Historic Site (@GarfieldNPS), before attending a performance of Shakespeare's The Taming of the Shrew. Be sure to see our photos of the Garfield house in our tweets from the tour. Every summer, we enjoy Cleveland Shakespeare Festival's (@Cleveshakesfest) free outdoor theatre at many different location in the Greater Cleveland area. Almost 300 people attended this evening's production as Cleveland Shakespeare Festival celebrates its 20th anniversary this year! We ended the day at a location that Julie and her mother recently discovered. The overlook deck at the Lake Metroparks' Lakefront Lodge (@LakeMetroparks) in Willowick is a great location to watch the sunset over Lake Erie on a summer evening. Since the Cleveland Metroparks (@CleveMetroparks) have taken over management of Edgewater Park, we have been visiting it more often. What made this Sunday in the park on July 2, 2017, special was that it was the first time that we saw the new Edgewater Beach House, which just opened this summer at the Edgewater Beach section of the park. It was nice to run into friends that we knew who were also visiting the park, and to hear the drum circle group that plays there each Sunday. We hope you enjoy our photos of the new Edgewater Beach House and the Edgewater Park sunset as much as we enjoyed being there. 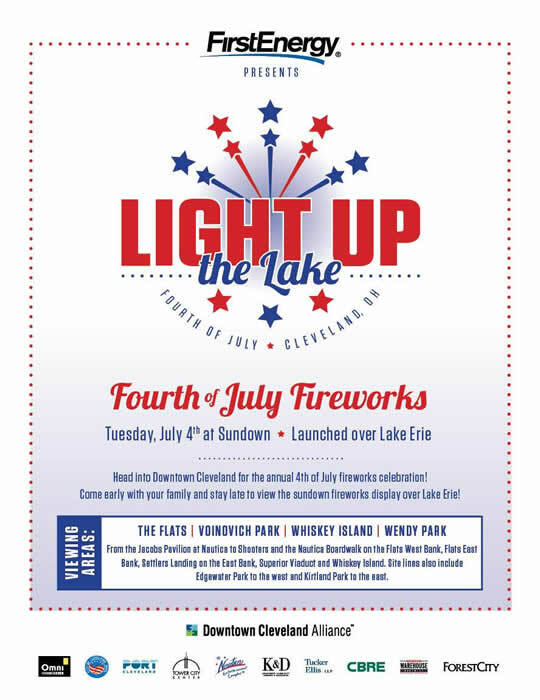 See the section about Cleveland Metroparks' Edgewater LIVE 2016. You can view all of our blog posts about the Cleveland Metroparks here. All we can say is that while we have enjoyed all the Cleveland Foundation 2014 centennial gift events, the gift of this Lake Link Trail is the greatest gift we can imagine! It will have a long-term impact on our community by creating a greenway tying our urban core to our local and national parks and beyond. The above quote is taken from our September 11, 2014, blog post "Take a Hike" - Cleveland's Flats & Beyond! Therefore, you can imagine how excited we were to learn to learn that another section of the Lake Link Trail had opened!! We also want to recommend Steven Litt's (@Steven_Litt - @ClevelandDotCom) article, First Look: Lake Link Trail in Flats opens Friday, has impressive views (photos), which in addition to useful information, includes some great maps. We are hoping that one of the partners developing this new Lake Link Trail will create a web page where we can find trail updates and maps.
.@daniellegarbo Enjoyed Centennial Trail Lake Link! After an early afternoon of bike riding in the Cleveland Flats, we decided to spend the late afternoon using our Cleveland Botanical Garden (@CBGarden) membership to hike in Holden Arboretum (@HoldenArboretum). There we went on the Murch Canopy Walk and climbed the Kalberer Emergent Tower, which both opened on September 6, 2015. This was our first time back since we visited on on Sunday, October 25, 2015, and wrote our blog post: Fall Fun! Pumpkinville and Holden Arboretum's new Canopy Walk & Tower! Climbing the 120-foot Kalberer Emergent Tower gave us the idea to end the day watching another Lake Erie sunset from the 50-foot Coastal Observation Tower at the Lake Metroparks' Lake Erie Bluffs (@LakeMetroparks). Both the Lake Link Trail in the Cleveland Flats, and the Lake Erie Bluffs tower tower were funded in part by the Cleveland Foundation (@CleveFoundation) (see our September 2016 tweet thanking the Foundation). The tower opened in September 2016 (see our September 4, 2016 photos on Twitter here). Sunset at Lake Erie Bluffs was a great way to end a day of outdoor activities! You can view all of our blog posts about the Cleveland Foundation here. A great day for a neighborhood #parade! As in past years, we celebrated Independence Day with a parade, picnic, and fireworks. In the morning, Julie joined other musicians to perform in a community parade. Then our son and his wife, Mike and Katie, hosted a great cookout at the Cleveland Metroparks (@CleveMetroparks) North Chagrin Reservation. For the final sunset of our extended Fourth of July weekend, we went to North Coast Harbor (@NCoastHarbor) for a great sunset, followed by the Cleveland Light Up the Lake fireworks celebration. The Downtown Cleveland Alliance (@DowntownCLE) held a Light Up the Lake social media photo contest. We will add the name of the winner of the #LightUptheLake photo contest here when it is announced. See more blog posts we have written about North Coast Harbor here. Thank you to all the great organizations that made these four days of fun possible. We look forward to visiting many more Northeast Ohio venues to enjoy Lake Erie sunsets. We also want to take this opportunity to congratulate the Cleveland Metroparks (@CleveMetroparks) on their centennial celebration. Here is a very interesting video about the symbolism in their Centennial Seal. Happy 100th, Cleveland Metroparks!